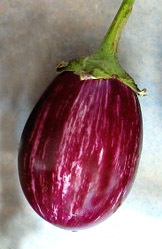 American and European eggplants almost exclusively belong to the species Solanum melongena L. Many authors have attempted to classified them, sort them in groups, but this is rather difficult due to the tremendous variety of shapes, sizes and colours (although they are less colourful than Asian and African types). The best that one can do is sort them by groups. An example of group classification, among others, follows. Catalogues call those "Cherry type" or "Cherry size" for obvious reasons. Of course as it is far too often the case some round-fruited cultivars are not in the " round-fruited group". The reason is that their size is more significant than their shape so they are placed in the Giganteum Group. This group is almost entirely composed of Asian cultivars. A most impressive display of 'Prosperosa' captured by Kristen Taylor at D.C. Dupont Circle market. 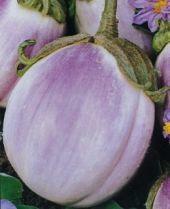 This variety is on the borderline, too large to be here, too small to be included into the Giganteum Group. 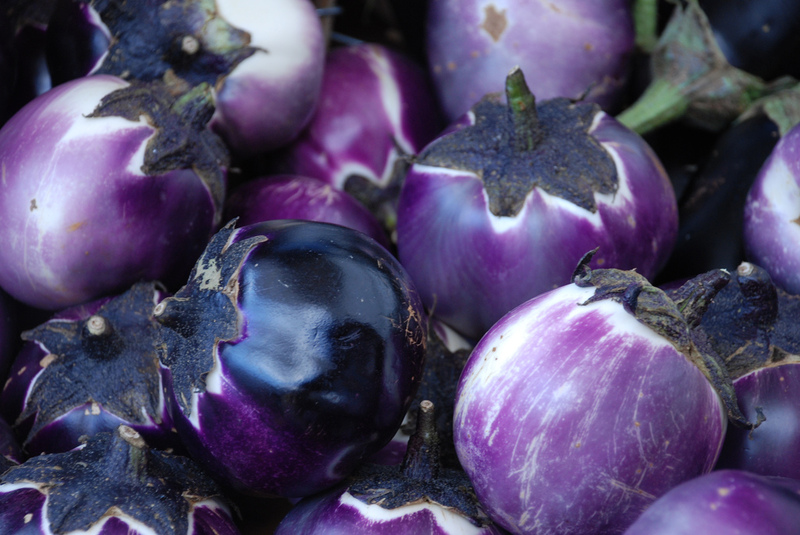 These are mostly represented by the Japanese cultivars such as Black Egg, White Egg (白卵形な す), Thai cultivars such as Yellow Egg, and Indian cultivars such as Egg Red but there are shades of these and other colours as well. 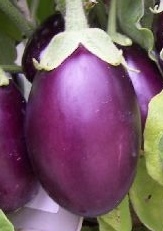 'Ophelia' (darker purple below) is one of the European cultivars. Catalogues call those "Egg type" for obvious reasons. 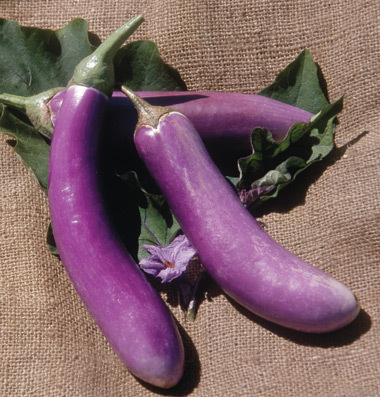 These are overwhelmingly represented by the Western types of eggplants. 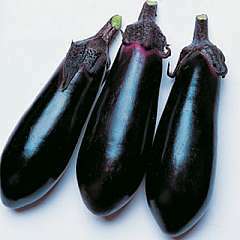 They are the large dark purple fruits of the supermarkets, and fresh markets of Europe and America. Some attractively coloured fruits from Italy, America and Asia such as the white, green and pink examples below feature in this group. 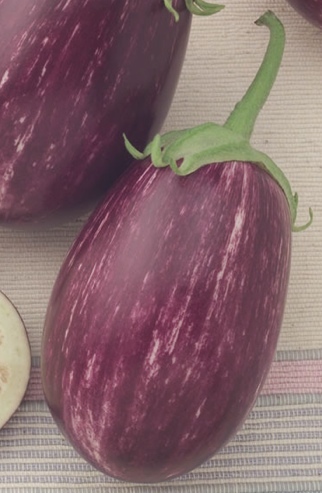 Catalogues and the trade consider those "normal eggplants" so they don't name them in any particular way, apart from using the cultivar name itself. There is a strong tendency in horticulture to replace those names by numbers, especially when referring to hybrids and GE varieties, something that as a lexicographer I dislike very strongly because it denies any sense of culture and tradition. This is understandable since those concepts are becoming obsolete in the brave new world order. I have to admit my bias here, I have deliberately left out any cultivar identified by just a number. 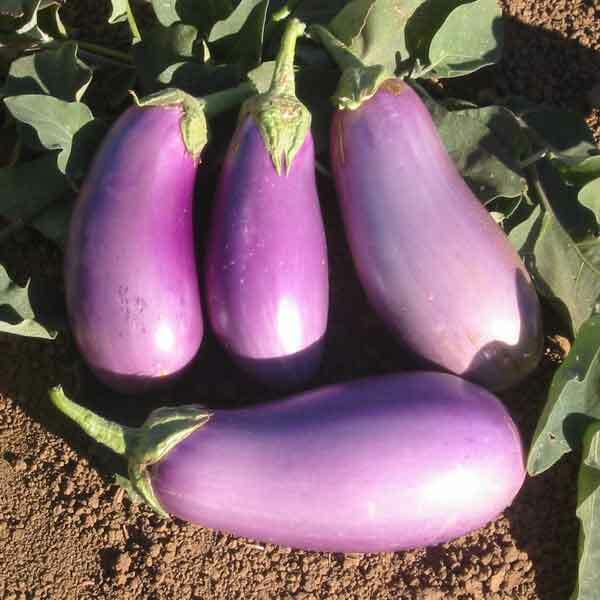 Sometimes catalogues use expressions like "Enorma type" based on a better known cultivar, in order to identify those eggplants with more precision within this large group. An off-type of Rosa Bianca "Pink Beauty"? we are trying to find the copyright owner of this beautiful shot. Any help appreciated. A form of something well known but still looking for an identity. 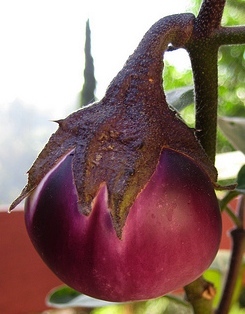 'Violetta di Firenze' ? In this group we find cultivars from both the East and the West. Many of the most attractively coloured fruits are in this group. To describe those, catalogues and the trade use expressions like "cluster type" or "Calliope type", based on a better known type or cultivar name within a particular trading circle. These fruits usually range in size from 3 to 8 inches in length. 'Long Purple' 6 to 8 inches long. 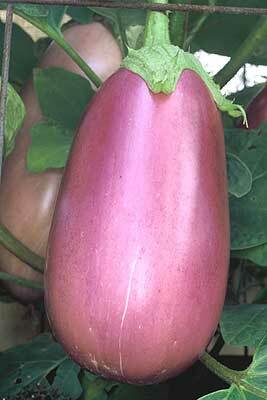 These are mostly represented by the Asian cultivars, Chinese in particular, but also a few Thai and one or two Italian. Consequently catalogues and the trade tend to name those after their country of origin. A Thai long type of a Chinese long type. These fruits range from 10 to 18 inches in length. 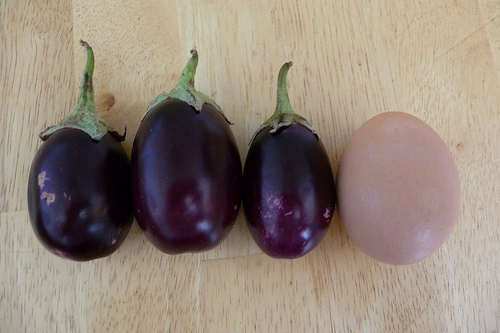 The intention in displaying the following table is to demonstrate that there is more to eggplants than the dark purple monsters from the supermarkets and to show a basic array of shapes and colours by naming a few cultivars. There are thousands more so they would not fit into a single table. A proper place would be a good searchable database. When we find one that we like we will let you know. We have collected far more data than was required for these articles. We will replace the tables in these articles by better more comprehensive records for each cultivar. This requires several more months in order to get clearance from various seed companies. If you are a programmer and good at handling databases we would like to talk to you. Together we may come up with something suitable. We have listed Asian and African cultivars in separate tables in their respective articles. We have done our best trying to identify every cultivar mentioned. If we have made mistakes please tell us. We have not discriminated between so called organic source of seeds and others in order to offer the broad spectrum of what is available in the world. Some of the companies listed are not seed companies but sources of material. They could be selling seedlings or even produce. 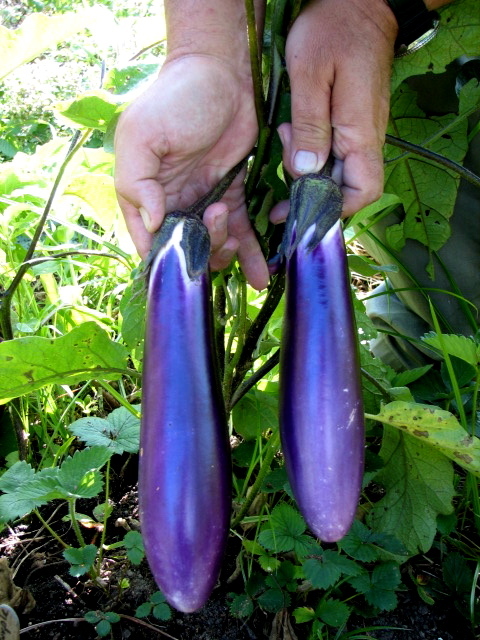 We are happy to point them out for they are part of the lesser known "eggplant world". Again if we missed something please tell us, we will update this table promptly. 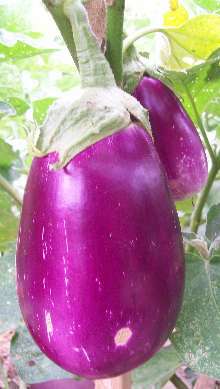 Italian cultivar. 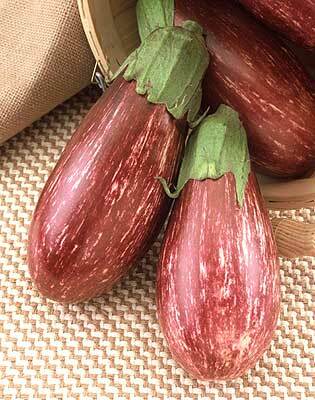 2'' x 6" beautiful, creamy white fruits with lilac-purple streaks. Flesh is extremely mild and bitter free. 90 days. Apple-green, medium-sized fruits. Tender skin doesn't require peeling. Choice variety for cool-season areas. 62 to 70 days. 24 inches plant suitable for tub growing. 3-4" lavendar fruits with apple green and white striping. 80 days. Italian variety with 3'' white fruits. 75 days. Plant may produce 10 to 15 fruits 6-1/2"" long by 5"" diameter. 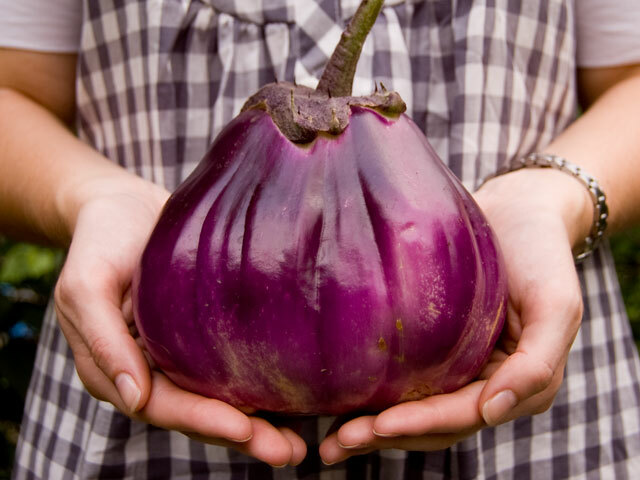 Fruits can be large but best harvested when smaller. 72 to 85 days. 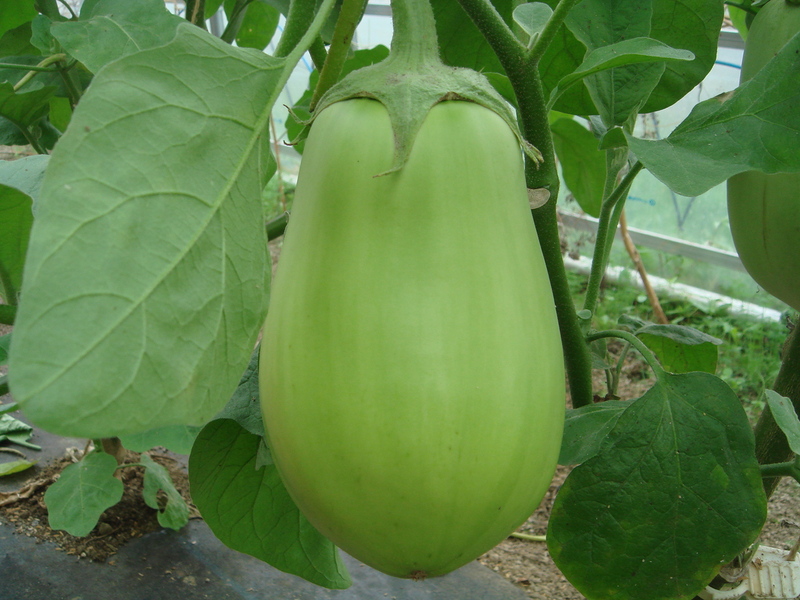 An early Japanese cultivar with small, tender, egg-shaped or pear-shaped fruits about 5 inches long. The 3 foot tall plant is somewhat tolerant of flea beetles, its foliage is green with purple veins. 65 to 75 days. 30 inches plant. 75 days. 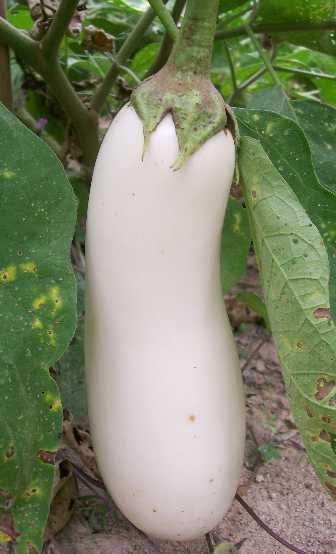 Creamy-white inside and out, with a lavender blush when ripe. Fine-flavoured flesh, 85 days. 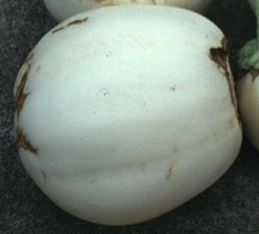 Oval white and purple striped fruit. 75 days. Shiny ivory white fruits are 6 inches by 2.5. 70 to 75 days. 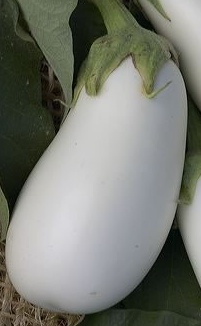 Slightly elongated egg-shaped white fruits 6 to 8 cm, 100g each. 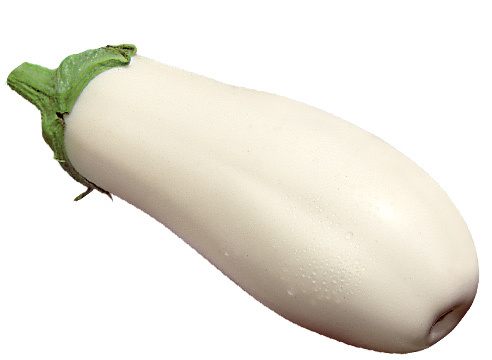 7" (17 cm) long pure white teardrop shaped eggplants. 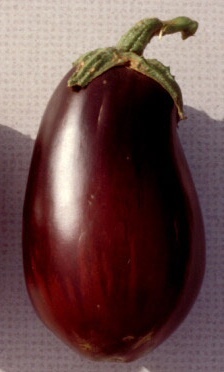 Eggplant has bitter-free taste and has white flesh. 65 to 75 days. 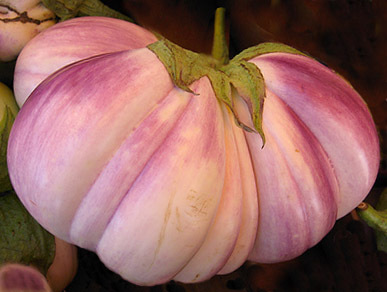 Long slender purple-veined fruits 30 cm long and 3 cm in diameter. White tender flesh with excellent flavour. Early producing plant tolerant of bacterial wilt. Plant disease and drought resistant. 3" round to oval apple green fruits. Mild flesh. Great stuffer. Seedy. The small snow-white fruits grow in clusters on plants 3' wide and 3' tall at maturity. 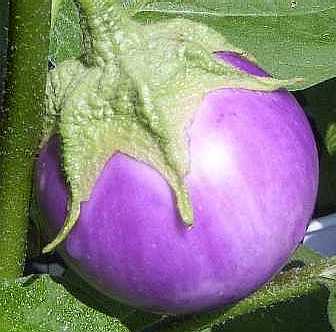 Best picked when the fruits are about 3 - 4 inches but the skin will remain tender if the harvest is delayed. Suitable for tub growing (container must be about 16" deep). 55 days. Clusters of three to six small purple fruits that will remain tender and sweet if the harvest is delayed. Plant suited to tub growing. 55 days. 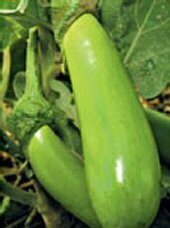 Elongated shape, shiny green fruits borne in bunches. 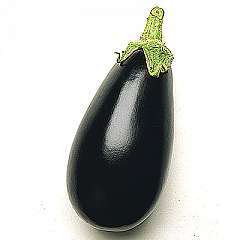 Purple eggplant, almost black. Very flavorful and tender. 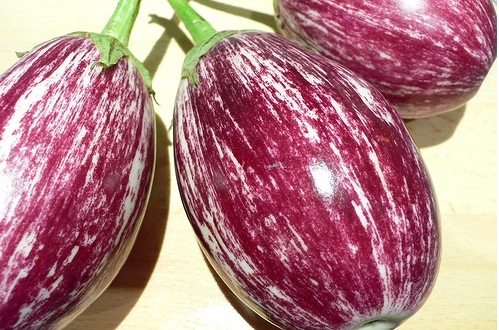 Small round fruit from India, brightly colored with neon purple and white stripes. Pretty white teardrop to cylindrical 5 to 7 inches fruits glossy ivory washed in soft lilac. with a lavender blush. Excellent flavor. 63 days. Plant is covered with bunches of slender banana-shaped fruits 3 or 4 to a single stem. 80 days. 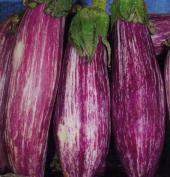 Italian eggplant with many culinary uses. 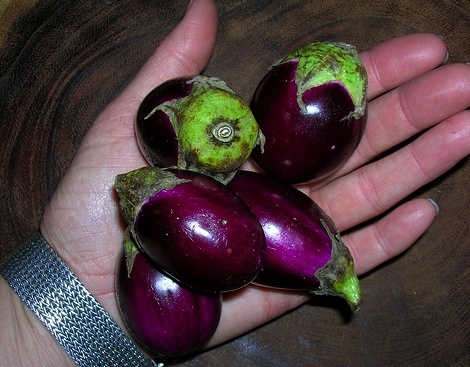 A smaller version of Lebanese Bunching. 75 days. 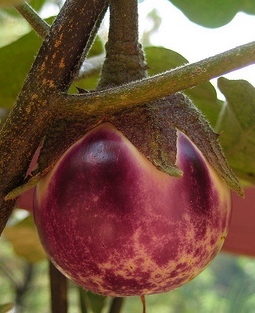 Sturdy, heavy-bearing plant with dark-purple fruits 2 -2.5 inches by 8 -10 inches long. Best picked before they are 1 inch in diameter. 4 fruits per plant. 70 to 80 days. 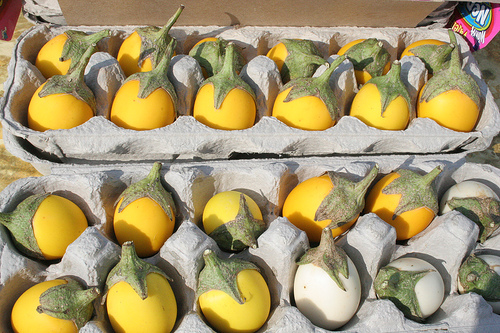 Available: Semi Al Portico, Southern Exposure Seed Exchange, Fratelli Ingegnoli. Anseme S.p.a. Italy. 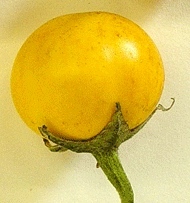 Productive oriental cultivar bearing creamy white fruits with a smooth silky sheen without bitterness. 80 days. Plant 3.5 feet tall with light green banana shaped 6 to 9 inches sweet fruits, sometimes with pale stripes. 85 to 100 days. 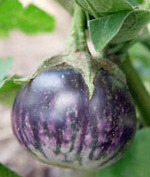 Uniform dark purple tender early fruits. Ripens to a deep bright neon pink color (Sometimes confused with Rosita). Vertcillium tolerant and very adaptable to many climates. 70 days. 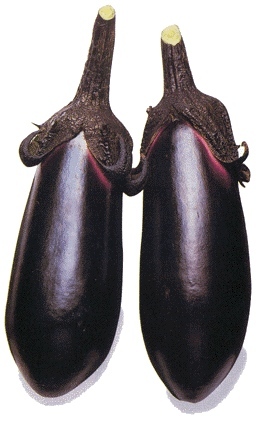 Jet black glossy tear drop- shaped fruits. 8-10" x 1 3/8" fruits with shades of fluorescent pink, pastel pink, and white with green calyx. Strong plant with high yields.. Virtually spineless, dwarf plants. 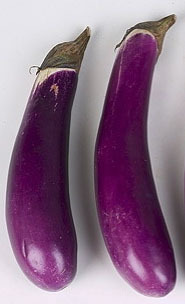 Finger-length 'baby' fruits, 5cm (2in) have dark-purple skins and are not at all bitter. 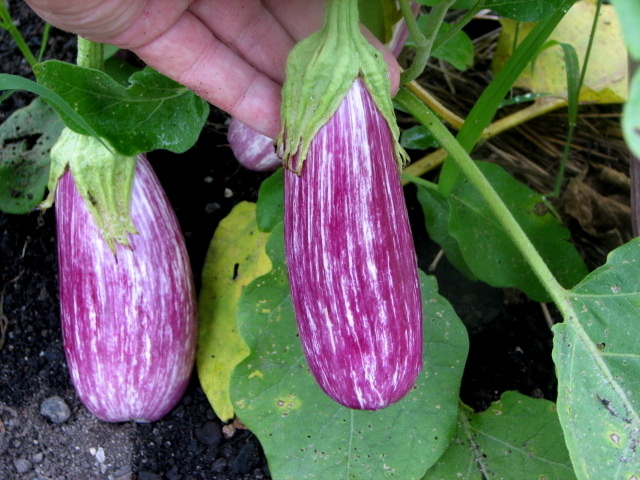 Italian eggplant with teardrop shaped fruits that are a lovely lilac or rose pink colour with thin white stripes running lengthwise down every eggplant. 85 days. Synonym of Ping Tung Long ? Synonym of Ping Tung ? Deep shiny lavender fruits . Keep plant upright in order to get straight fruits. 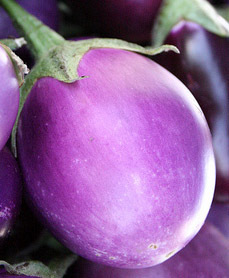 Italian eggplant. A real standout in the garden. Quite productive. 80 days. 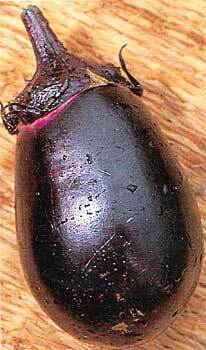 Long Chinese type, dark purple almost black fruit. Fruit are about 10 inches long and 2 inches wide. Almost seedless at young stage. 55 days. 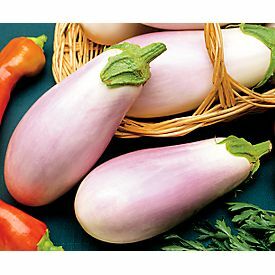 Italian heirloom, medium-sized 5-8 inch oval stunning light pink fruits with occasional creamy white shading, meaty, mild flavor with no bitterness, plants are 30 inches tall. 75 to 90 days. 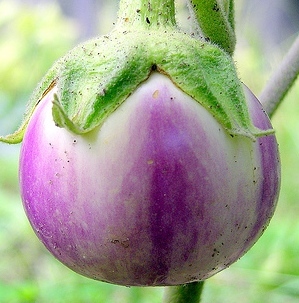 Lavender pink teardrop-shaped fruits. The white flesh is mild and sweet. The fruit skin is tender without a trace of bitterness. from Puerto Rico. Southern Exposure favour it over Rosa Bianca (an Italian heirloom). We experience the opposite. Rosita performs very poorly for us. 70 to 85 days. 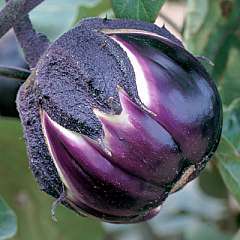 Available: Marianna's Heirloom Seeds, Baker Creek Heirloom Seeds, Sais Sementi s.p.a., Fratelli Ingegnoli S.p.a, Anseme S.p.a. Italy. Brilliant rose-pink fruits are teardrop shaped. Bright white shadow around the calyx. 90 days. 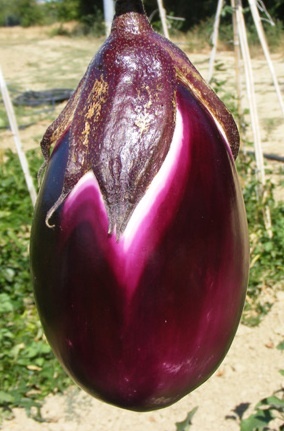 10 cm purple fruits on 40 cm plant. 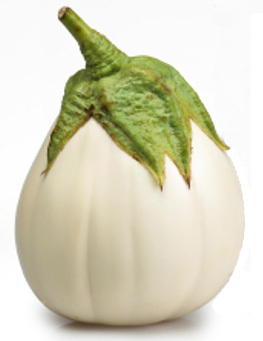 Medium white 18cm fruits with creamy white flesh and firm white skin. Green striped egg-shaped orange fruits 7 to 8 cm long. Strong flavour but not bitter. 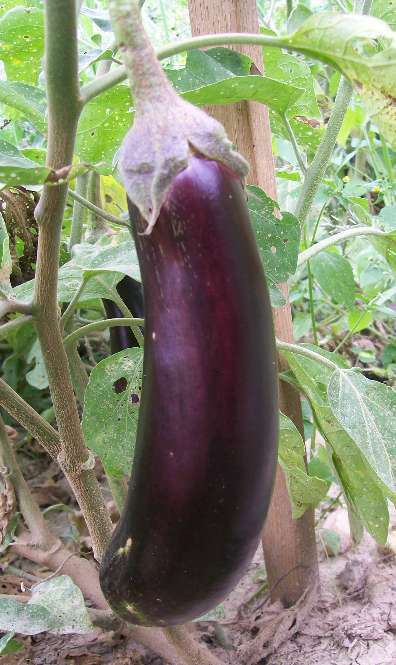 Productive, with long black fruits up to 16 inches. Mild and sweet flesh. 80 days. Plant suitable for in hot, humid areas (Sydney). 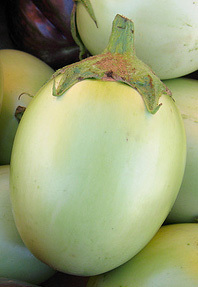 Fruits average 5 to 6 inches in length, are slightly oval in shape. 70 days. 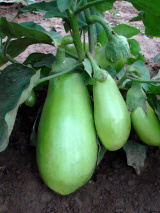 Plant 30 - 36 inches tall with tapered teardrop-shaped, smooth creamy white fruits. 2 x 6" dark purple fruits. Mild fleshed. 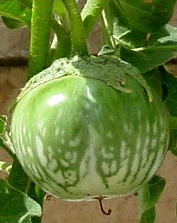 Italian style fruits approx 15 to 20 cm. Maturing in approx 70 days. Note on the following companies. A number of those are part of complex corporate structures and are difficult to contact directly. The main address that we give below is a starting point. We are not sponsored by any of those companies nor do we receive any favour from them apart from the odd catalogue photo. It would be nice to be able to link directly to a gallery or a photo or a description but this is sometimes impossible and practice has taught us that these links never last long anyway because online catalogues / sites are updated too often. The seed sources likely to carry Open Pollinated / bio ag. friendly cultivars are tagged with (O.P. cvs), Others are more likely to carry some hybrids but they may have also some organic sections such as Graines Baumaux. Few are either totally "organic" or completely "non organic" ie. 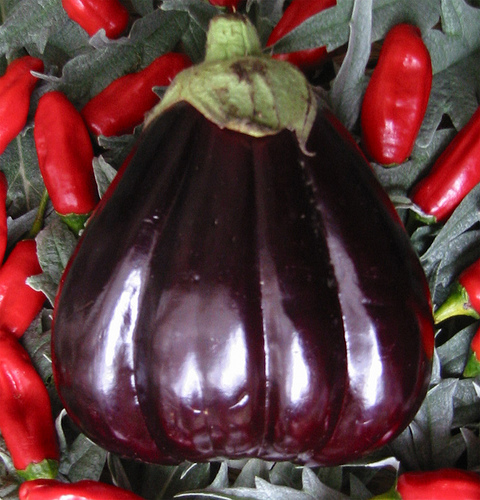 holding only hybrids (F1 cvs) or GM cultivars. Graines Baumaux France. (17 O.P. cvs) + (12 F1 cvs). An interesting blog with comments on the Australian Quarantine Information System administering Quarantine Laws. 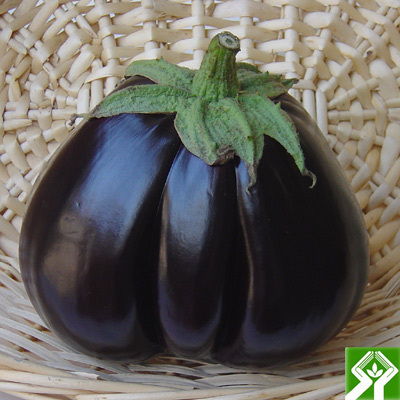 Farmers markets seem to be the only retail sources for extra ordinary fresh eggplants. Here are some beautiful examples captured by Flickr members. Finally for the reader who has never had the pleasure of seeing beautiful packets of seeds here are some self identified beauties (download the Powerpoint file to your desktop and view it with Internet Explorer - it will save you hassles. Reduce the size of the display so that the first seed packet photo is the size of a "standard" packet for clarity). I wish to acknowledge the kind cooperation of many colleagues mentioned throughout this article and mostly all my flickr contacts who have provided useful comments and many of those beautiful photos. Many thanks to all.